Alien Spinvasion slot will immediately trigger thoughts of Sci-Fi by its title and you wouldn't be wrong. 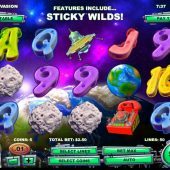 The theme is cartoon-style aliens, spaceships and weapons which will bring to mind slots such as NetEnt's Alien Robots slot although it reminds me more personally of Microgaming's Galacticons due to the character symbols. The game has a serious movie type soundrack of doom-laden music and naturally sound effects to match the space theme such as Ray Gun noises when counting the wins up. The reels are transparent and sit above a spectacular view of the Earth taken from space. So far so good, but will this be one to invade your slot playing time? We begin with a sizeable 50 pay lines but only over 3 rows and 5 reels. There are the standard card values in the appropriate design and various other icons include asteroids, ray gun, alien blob, planet Earth and the alien spaceship with lastly an odd-looking red telephone. The pays are very low and we will shortly find out why. Planet Earth pays 5x stake for a 5-of-a-kind followed by the telephone at 2.5x down to the lowest card value (the 9) which pays a mere 9 coins: as you bet 50 coins this is less than a fifth of a credit, but wait for the pay for 3-of-a-kind 9's - ONE coin, yes 1/50th. of your bet! Usually this will only occur on slots with stacked symbols offering multiple pays, but we don't even have those. Ok, I may have teased you a bit there, a case of "Do you want the bad news first?" because now we will see the positives. You have a one-eyed green monster on the reels which is in fact a Sticky Wild with no multiplier. When it appears it will remain in place for a respin if forming a win, and continue to do so until no further counting Wilds are added. This is in essence the same as the base game of Netent's Creature from The Black Lagoon slot. This kind of makes one more optimistic about the low pays as often you get repeated wins. I haven't mentioned a scatter symbol because we don't get one - the spaceship General randomly appears over the reels and grants you 11 free games. Against a background of a woman's voice WARNING! WARNING! we are faced with a Red Alert and a new reel set. The lowest symbols are removed and replaced by rockets which pay 2x stake for 5-of-a-kind and you get Rolling Reels in which any winning symbols are removed and replaced by further ones from above like in the Thor Free Spins on Thunderstruck 2 slot. Similarly you also get an increasing Monster Multiplier for successive wins, 1x then 2x, 3x, 5x, 7x and if hitting 6 or more successive wins they are paid at 11x multiplier. You don't get any Wilds on the reels during this feature and I can only assume it's possible for the General to appear again during these free games for a random retrigger.